What happens when a conservative president makes a liberal professor from the Ivy League his top urban affairs adviser? 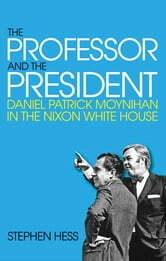 The president is Richard Nixon, the professor is Harvard's Daniel Patrick Moynihan. Of all the odd couples in American public life, they are probably the oddest. Add another Ivy League professor to the White House staff when Nixon appoints Columbia's Arthur Burns, a conservative economist, as domestic policy adviser. The year is 1969, and what follows behind closed doors is a passionate debate of conflicting ideologies and personalities. Who won? How? Why? Now nearly a half-century later, Stephen Hess, who was Nixon's biographer and Moynihan's deputy, recounts this fascinating story as if from his office in the West Wing. Daniel Patrick Moynihan (19272003) described in the Almanac of American Politics as "the nation's best thinker among politicians since Lincoln and its best politician among thinkers since Jefferson", served in the administrations of four presidents, was ambassador to India, and U.S. representative to the United Nations, and was four times elected to the U.S. Senate from New York.